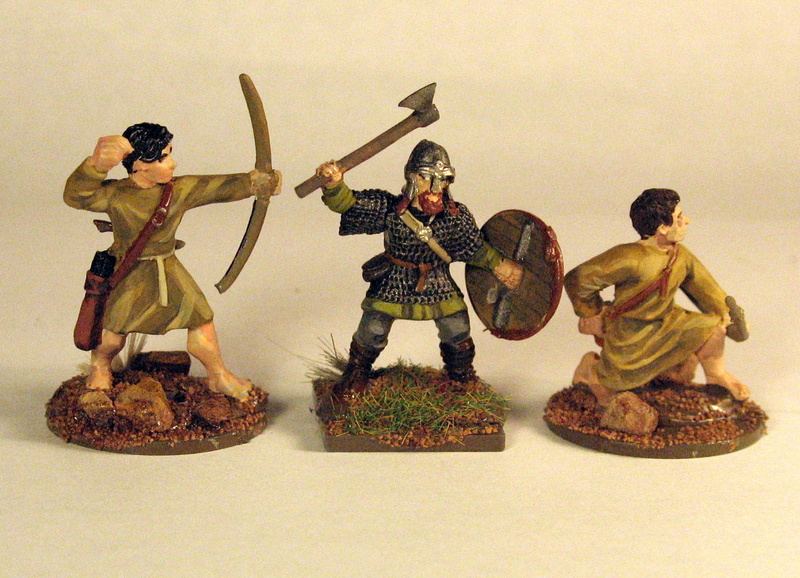 I finished a unit of Welsh archers by Gripping Beast recently and I had a blast painting them. The poses are well articulated, the cloaks and robes have the right amount of drape and fold and the faces are expressive. The only drawback is their size. For a "heroic 28mm," their eyes are a standard 28mm, but they are fairly bulky. Posed next to Gripping Beast's plastic Vikings, a Welsh peasant looks like they could overpower the Norse warrior. But on a game table, from four feet away, it matters little. I especially like the figures with the cloak. Adding a pattern to the fabric was something I debated, but for poor skirmishers, plain red cloth was enough of a luxury. For a non-fiction history of the Wales in the Dark Ages, I recommend The Welsh Kings: Warriors, Warlords and Princes by Kari Maund. Spanning the late Roman era through the late thirteenth century, Maund focuses on political and dynastic change in Medieval Wales. It is solid political history, so anyone looking for a broader look at Welsh culture might want to look for a social history of the period. Similarly, Maund gives an accurate and detailed account of what we know and do not know about Welsh battles with each other and against others, but it contains few descriptions of Welsh weaponry, armor or tactics. Nonetheless, The Welsh Kings is well titled. It is a story of kings, and I came away from its 240 pages enlightened about the small fractious kingdoms of western Britain. The best historical fiction I read set in Wales remains the previously suggested Hood trilogy by Stephen Lawhead. It was very surprising to find an author capable of exploring the Robin Hood mythos in a fresh and moving manner, but this series succeeds. Deserving of repeated readings.